Bible Lesson: Jesus was no ordinary man, although he was a man. Neither was he simply an especially good man, although he was good. This is a reality children can and should learn early. As the Messiah, Jesus was the promised “seed” of Genesis 3:15 and the “Anointed” one anticipated in the entire Old Testament. 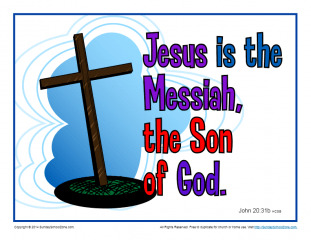 He was, as recorded in John 20:31, the “Son of God.” This scripture poster states this fundamental truth simply as a wonderful reminder children can place on a wall or mirror.